This document contains five country reviews (South Africa, Nigeria, Côte d'Ivoire, Kenya and Zambia) and one regional synthesis paper on the animal and aquafeed industry in sub-Saharan Africa. Surveys of the existing aquaculture and aquafeed industries were undertaken with the purpose to determine the status of commercial aquafeed production in sub-Saharan Africa, and to provide an indication of the region's potential to produce aquafeeds. Aquaculture production reported for the five countries was found to vary between 1 000 and 30 776 tonnes per annum. While Nigeria was the largest producer, Zambia reported the lowest production. Nigeria was the largest producer of manufactured aquafeeds (10 760 tonnes both in 2000 and 2001). With the exception of South Africa, farm-made feeds were found to supply a significant proportion of all the countries' aquafeed requirements. Major feed ingredients that are used in livestock feed production were generally available across the region. In some countries, difficulties were reported in obtaining supplies of fish oils as well as specialised vitamin and mineral mixes. A projection of future aquafeed requirements for 2015 suggests that all countries will have the potential to produce sufficient aquafeeds using existing production capacities. Key indicators identified for a country's ability to produce aquafeeds were existing livestock feed manufacturing capacity, availability of suitable feed ingredients for incorporation into aquafeeds, availability of suitably trained personnel, and favourable legislative and taxation system. 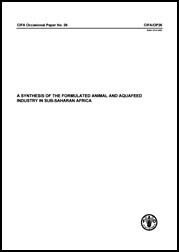 A synthesis of the formulated animal and aquafeeds industry in sub-Saharan Africa. CIFA Occasional Paper. No. 26. Rome, FAO. 2005. 61p.